The Metal Arts Guild was founded in 1951 by a small group of artists working in the relatively new field of jewelry and metal arts. Many early members played a significant role in the “evolution of the American studio Jewelry movement and modernist American jewelry”. Margaret de Patta, merry renk, Francis Spensen, Byron Wilson, Vera Allison, Bob Winston, Irena Brynner, Peter and Virginia Macchiarini and Florence Resnikoff were among the first members. At that point MAG began sponsoring juried exhibitions and participating in shows put on by the San Francisco Art Commission, Bay Area museums and Fort Mason. “MAG was established in 1951 to promote the metal arts and protect the economic interests of its members. Up until that time, there was no group or union in the United States that specifically addressed the unique needs of studio jewelers. Today the organization, which celebrated its 65th birthday in 2016, serves much the same function by providing support and resources to our members through social events, workshops, classes, exhibition opportunities, scholarships, grants, and lectures. Jeweler, sculptor and former Head of the Jewelry / Metal Arts Program at the California College of the Arts in Oakland, CA passed away April 2013. Florence Resnikoff is recognized as being an early investigator of metalworking processes and techniques like anodizing and electroforming, which she utilized in her jewelry and sculptural designs. Resnikoff began exploring enameling by reading books on the topic while working as a registered medical technician in Chicago. In 1949 she took a one-week workshop at the summer school of the Chicago Art Institute where she was introduced to metalwork by Robert Von Neuman. It was at this time that Florence became interested in becoming a metalsmith. In the early 1950s, she relocated to Palo Alto, California and had her first one-person show at the Art Gallery at Stanford University in 1956. In 1958, she had a second one-person show at the Art Room at the Chicago Public Library. These two shows qualified her for the professional level status in the Metal Arts Guild (SF Bay Area), where she met Margaret De Patta, a jewelry designer whose modern approach to structure and materials guided Resnikoff’s jewelry-making investigations. Her interactions with the Metal Arts Guild helped her build her repertoire of techniques and materials in which she accented her gold and silver jewelry with colorful jewels and enamels. In the early 1960’s, she returned to school to pursue a degree in sculpture, studying at the California College of Arts and Crafts (BFA in Sculpture, 1967) and San Jose State University (MA in Art, 1973). In 1968, Florence began to teach herself about electroforming and with her husband’s electronic knowledge, set up her first electoforming tank. She also taught herself about anodizing reactive metals and learned more about the subject after a trip to the Royal College of Art in London in 1978. In 1973, an NEA grant allowed her to further her studies of electroforming with Stanley Lechtzin at Tyler School of Art in Philadelphia, PA. In 1973, she returned to CCAC as a teacher and later became a professor, serving as Head of the Metal Arts Program. While Program Head of Jewelry and Metal Arts at CCAC, Florence received an NEA Grant to bring leading craftsmen to CCAC for a series of one week advanced workshops during the summers of 1979 -1983. Artists that taught included June Schwartz, Helen Shirk, Harold O’Connor, Fred Fenster, Douglas Steakley, David La Plantz, Florence Resnikoff, Merry Lee Hu, Jamie Bennett and Edward De Large, among others. Florence’s later work included both jewelry and liturgical commissions. Florence retired as Program Head of the Jewelry & Metal Arts Program at the California College of Arts & Crafts in 1989 and was designated a Professor Emerita in 1990 and the Florence Resnikoff Emerita Scholarship Fund was created at the California College of Arts at this time. Among her many honors and numerous exhibitions, Resnikoff was named a California Living Treasure in 1985. Her work in included in the permanent collections of the City and County of San Francisco, The California Art Collection of the Oakland Art Museum, the Smithsonian American Art Museum, the Boston Museum of Fine Art, and the Permanent Collection of the Museum of Arts and Design, NY. In 2012, an early sterling silver neck piece by Resnikoff was featured in the Los Angeles County Museum of Art show “California Design, 1930-1965: Living in a Modern Way”. Founding MAG member and past President, and jeweler/artist, merry renk, passed on June 17, 2012. She was dear to our hearts, very active in the Guild all the way to the end, celebrating her 90th birthday with us during MAG’s 60th Anniversary year. She was our joyful Metal Mother and an inspiration to so many artists. merry will be deeply missed but surely never forgotten; she was a thorough documentarian of her career and she reached so many generations that the stories will flow freely for years to come. We are better people for having known you, merry. Peace. An Oral history interview with Merry Renk from 2001 conducted by Arline Fisch for the Smithsonian Institute Archives of American Art is an excellent documentation of her life. In addition to the text, there is also a MP3 excerpt. Her two daughters Baunnie Sea and Sandee Curtis, grandson Ian Espinocilla, and two grandaughters – Elinor Espinocilla and Sabrina Settle, survive her. Focus on the Past: Founding Members merry renk & Florence Resnikoff, by Carolyn Tillie. Originally printed in the 60th Anniversary MAG Guildletter (Apr 2011). Francisco. Founded in the fall of 1948 and spanning 3 generations of Macchiarini, it is now the oldest continuous metal arts, modernist design studio, and gallery in the United States. Visit them in San Francisco where son Daniel and granddaughter Emma continue his legacy. In 2011, the jewelry of Peter Macchiarini and merry renk were featured in the exhibition, California Design1930-1965: “Living in the Modern Way” at the Los Angeles County Museum of Art (LACMA). Exhibition Oct. 1, 2011 to March 25, 2012 Catalog Show Book Co-Published by LAMCMA/MIT Press, 2011. In 1979, Brynner wrote “Jewelry As An Art Form,” a book that chronicled her early career and provided instruction on design and techniques. A founding member of the Metal Arts Guild, Oakland native Byron Wilson’s work was an outstanding example of California Modernism. Mostly self-taught, he started making in the 1940’s, but by the 1950’s his work had made a lasting impact on the studio jewelry movement of the time. He was hired as a professor at the California College of Arts in 1956 where he taught for 25 years. Byron Wilson’s art often incorporated organic shapes and color contrasts formed through the utilization of natural materials like ebony wood and walrus ivory. The use of strong geometric elements, made from precious metal, helped to frame non-reflective components. He also made use of innovative casting methods to create forms in silver that were difficult to achieve through hand fabrication. The Los Angeles County Museum of Art (LACMA) has an extensive collection of Byron Wilson’s pieces. Byron Wilson died in 1992. More information on Byron Wilson is available here. 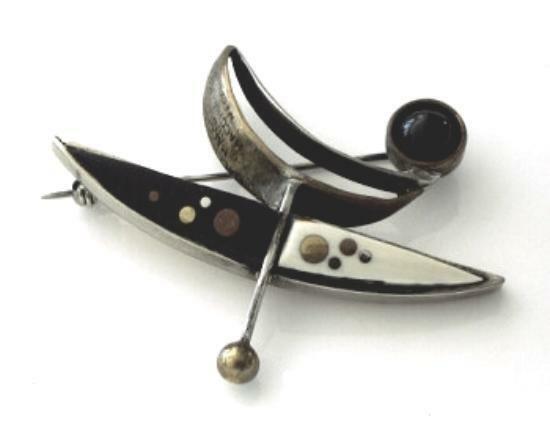 A founding member of the Metal Arts Guild, is best known as a painter and modernist jewelry designer. 12 Peter Macchiarini also befriended painters Diego Rivera and Frida Kahlo when they came San Francisco. Peter Macchiarini, interview by Mary Fuller McChesney, October 18, 1964, Archives of American Art, Smithsonian Institution, Washington, DC. ; Daniel Macchiarini, interview by author, San Francisco, CA, January 29, 2009. 13 Irena Brynner, interview by Arline M. Fisch. 24 Marbeth Schon, Form and Function: American Modernist Jewelry, 1940-1970, 198. Irena Brynner, Peter Macchiarini, and Florence Resnikoff. “Metal Rising: The Forming of the Metal Arts Guild, San Francisco (1929-1964).” Masters thesis, The Smithsonian Associates and Corcoran College of Art and Design, 2011. In 2011, Jennifer Shaifer wrote her master thesis (The Smithsonian Associates and Corcoran College of Art and Design) about the Metal Arts Guild “Metal Rising: The Forming of the Metal Arts Guild, San Francisco (1929-1964).” This thesis documents the political, social and crafts movements that led to the development of the Metal Arts Guild and addressed under-researched scholarship pertaining to its significant role in the American studio jewelry movement. Jennifer Schaifer is a decorative arts historian and product developer in the accessory and fashion industries. She is currently an Adjunct Professor at the Fashion Institute of Technology in New York City. The Metal Arts Guild Library offers a unique collection of books, and catalogs that document the mid 20th century jewelry movement and past MAG members. Contact the Metal Arts Guild librarian to make an appointment. View a list of our unique library online.